Foraging is the new hot thing. It’s not just about local food anymore – it’s about über local, wild foods, picked YOURSELF. That’s right – this is not for the faint of heart. This is stomping around in the woods, braving mud and creepy crawlies and thorns all to get a few plants. Have I grossed you out yet? Good. Now for the disclaimer. You have to be really careful when foraging. Know where you are going (you might end up trespassing or be in a place you don’t have permission to take plants from), exactly what kind of plant you’re looking for (if you’re wrong it might not be edible or alternatively toxic) and exactly how much you can take. You need to know what you’re doing – or else. [Cue the menacing music] Seriously – you could end up in a world of hurt or even dead if you’re not sure. I decided to take a low-key peek around our yard. If I didn’t find anything, no harm no foul – and I would avoid that whole wrongful entrance without proper authority or consent upon the real property of another thing. (And between you and me I wouldn’t look like a complete moron in public staring at the ground not knowing what to look for.) So, I started close to home. We are living in a house that is surrounded by tall pine and oak trees and bordered by a small river. The trees leave us very shaded most of the time – our front “lawn” is a combination of grass and moss. We also have a steep hill down to the river with lots of mud and leaves – very swampy. Inspired by Peter at Cook Blog, I began the hunt for wild alliums. Not only because his pickled wild garlic looks great in jars, but because alliums are super safe. Anything that smells like onions or garlic generally won’t kill you – good territory for the newbie forager. 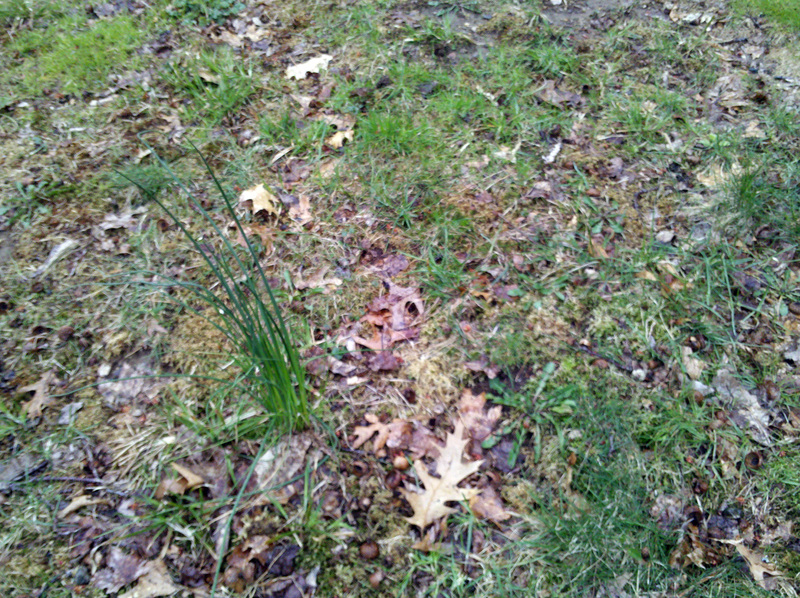 Lo and behold – our mossy lawn had a bunch of wild garlic! Super easy to spot, though I did confuse them with tall grass at first. As Peter says, it pays to be discerning here (which I, of course, figured out after the fact). Wild Garlic tends to grow in clumps, as little cloves branch off from the main bulb. The big bulbs naturally have the widest and tallest stems. I ended up picking whole bunches at first – and painstakingly cleaned those tiny bulbs. Anyway – be picky! Trust me. I found enough here for one jar of wild garlic pickles. Could I have made more? Absolutely. In fact, I see wild garlic/onions EVERYWHERE now. But a) I didn’t want to dig up the whole lawn and b) I want to make sure I’ll use them before making a ton. This way, I can save more for next year’s harvest. Not picking everything in sight and saving more for next year is half the battle with foraging. There’s quite the controversy about ramps (also known as wild leeks). Ramps are prized for a variety of reasons – they’re delicious, they’re the first bit of fresh greens that surface after a long winter, and they hold a lot of tradition as a foraging prize. They’re becoming very trendy in higher end restaurants, and as a result the US Forest Service thinks we’re overharvesting. The thing is with ramps – you don’t just take that year’s growth. You dig up the whole thing, like with other wild alliums – the whole bulb comes out. I really, really wanted to find ramps. Though they do carry them at Whole Foods, they always seem wilted and lifeless and don’t last more than a few days. Much to my surprise, I found them in droves near the river. Naturally, on a typical April day (read: cold and rainy), I hauled out my Xtratufs and went down the muddy hill. Not on the scale of what The 3 Foragers seem to find, but plenty there all the same. Most importantly – plenty to leave for next year. I probably picked about 20%. 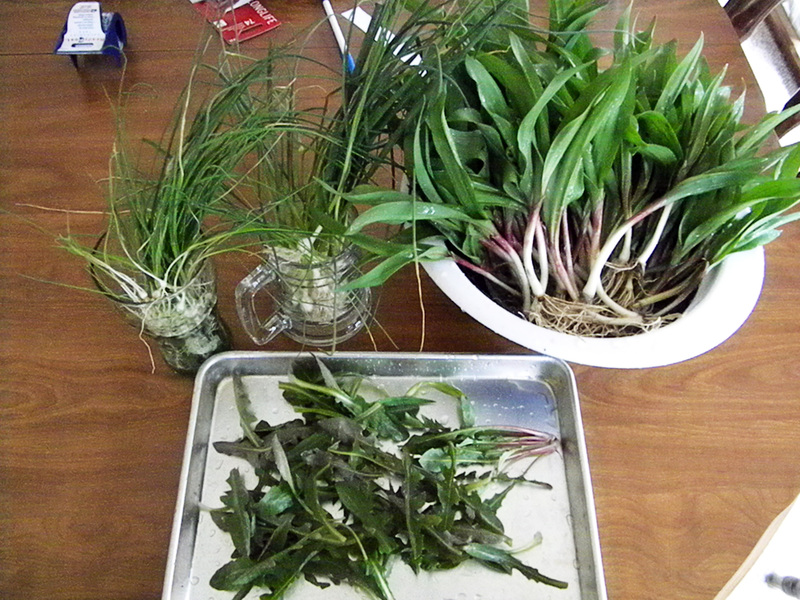 The haul: wild garlic, ramps and some dandelion greens. Not bad for a first outing – huh? So what do to with the bounty? First and foremost – be prepared to preserve it quickly. The wild garlic is fairly sturdy but the ramps started wilting pretty quickly. You just went through all this trouble – no sense in throwing it all away. Everything needs a VERY good rinse. I chopped the ramps greens from the stems and soaked them separately (like you would leeks) to make sure all the grit was out. I ended up with two quart size bags of greens to freeze, and about a quart’s worth of stems/bulbs. In retrospect – I probably picked too many small ramps, but once I had picked them I wanted to use all of them. Another batch of pickles was born. Make sure you have the correct jar for the job – I always measure my pickles in the jar before I put the jar in the waterbath canner to heat up. While the canner heats, I make the brine in another pot. I use a 2:1 vinegar-water ratio, with one tablespoon of salt. This means 2 cups of white vinegar, one cup of water, and one tablespoon of salt for this recipe, but if you were to double it it would be 4 cups of vinegar, 2 cups of water and 2 tablespoons of salt – you get the idea. You will have a little brine leftover – which I always use to quick pickle any veggies left in the fridge without processing. Anyway – proceed according to normal waterbath canning instructions (if you’re unsure always consult the Ball Blue Book): boil the jars, pour boiling water over the lids and rings, and boil your brine. The combination of hot jars + hot food + warm, wet lids minimizes the chance for something to go wrong. 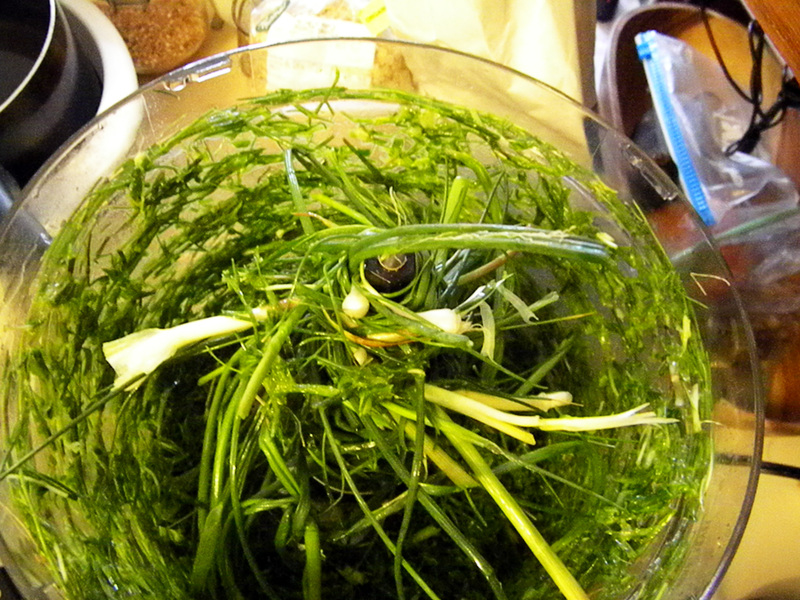 I pack the ramps and bay and sage leaves into the jars and top with hot brine, and put in the waterbath for 10 minutes. Yields one wide-mouth quart. Same idea as above: hot jars + hot brine + wet, warm lids and rings. Also yields 1 wide mouth quart. A great first foraging project! Local, homegrown, home foraged AND gorgeous – what’s not to like? -Kaela at Local Kitchen has a great ramp roundup. I must try her Chicken Braised in White Wine and Ramps. -Joel at Well Preserved uses the whole plant – even dehydrates the roots! Imagine crunchy oniony garlicy bits sprinkled in your morning eggs or over a bowl of soup… even more proof I need to get a dehydrator and/or figure out how to do this in the oven. -I found this spoonbread recipe from the New York Times. Though it calls for green chiles, I think it would be lovely with some ramps greens and some goat or cheddar cheese. This entry was posted in foraging, pickles, preserving on April 22, 2011 by Kate @ Snowflake Kitchen. Thanks for the link love. 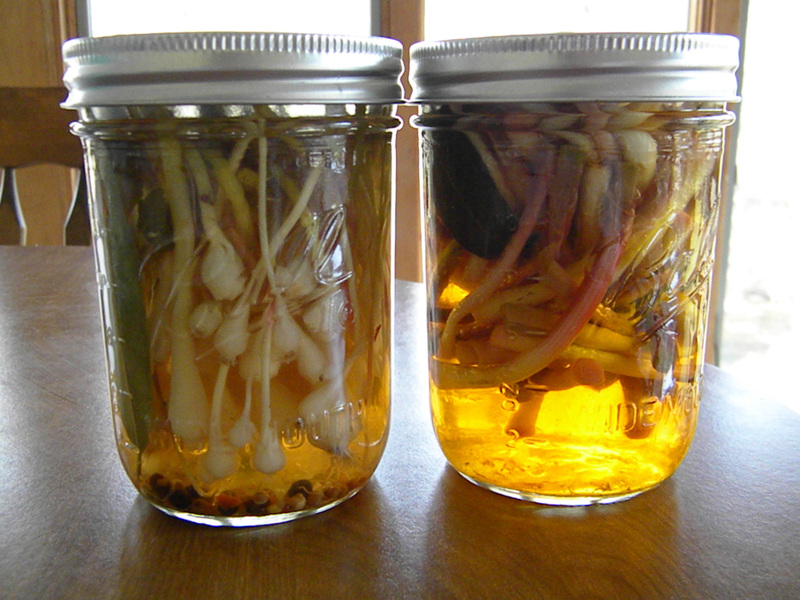 We use our sweet/sour pickled ramps bulbs in a martini. Sometimes the husband just munches them raw. Tasty! I grew up in West Virginia and remember attending Ramp Festivals as a child. I thought I’d eaten (and sweated out) ramps in every possible way, but I don’t think I’ve ever tried them pickled! Can’t get them here in Arizona, so I’ll have to live vicariously through your post – thank you for sharing! I grew up in pennsylvania but been to ramp festivals in wv. i pickle them every year.